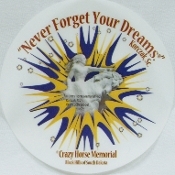 Show your support for Crazy Horse Memorial in your car, home or office with our eye-catching window decal. 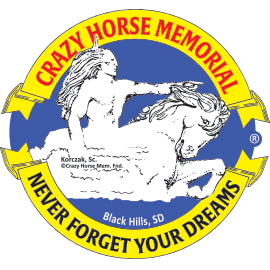 Beautifully displays the model of Crazy Horse Mountain and Korczak's favorite saying, "Never Forget Your Dreams®" Non-permanent adhesive. 5" in diameter. Made in the U.S.A.